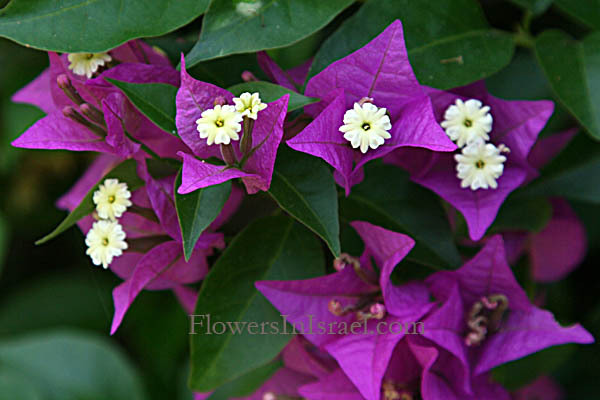 Bougainvillea, named in honor of Louis-Antoine, Comte de Bougainville (1729 – 1811), an admiral in the French Navy. glabra, glaber, hairless, smooth, bald; glabrous. Any plant of the genus Bougainvillea, comprising about 14 species of shrubs, vines, or small trees hardy in warm climates. Many species are spiny. 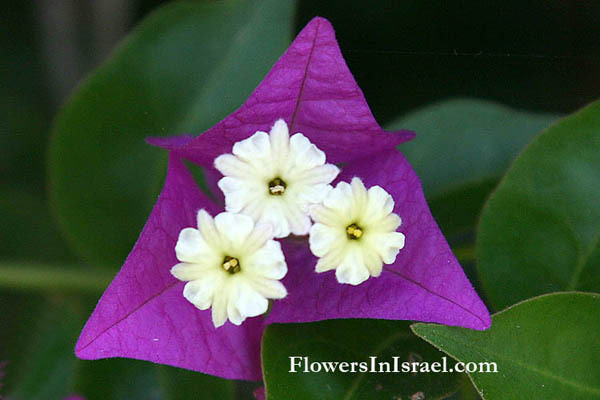 The inconspicuous flowers are surrounded by brightly coloured papery bracts, for which one species, Bougainvillea glabra, is called paperflower. The bracts of various species range from purple to lemon-yellow. The standard author abbreviation Choisy is used to indicate Jacques Denys Choisy (1799–1859), a Swiss botanist and Professor of Philosophy at Geneva. 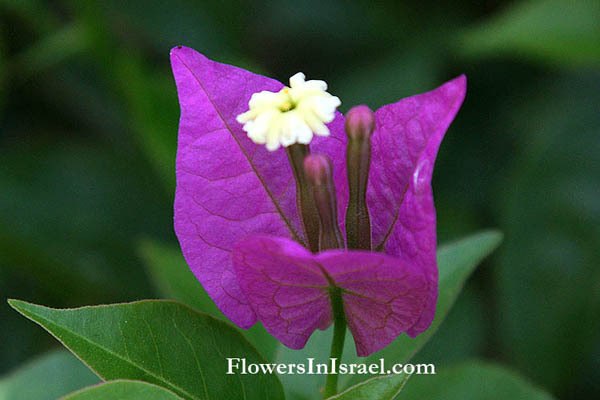 Bougainvillea is a genus of flowering plants native to South America from Brazil west to Peru and south to southern Argentina (Chubut Province). The first European to describe these plants was Philibert Commerçon (1727 – 1773), a French botanist accompanying French Navy admiral and explorer Louis-Antoine, Comte de Bougainville, during his voyage of circumnavigation, and first published for him by Antoine Laurent de Jussieu in 1789. In 1766 Bougainville received from Louis XV permission to circumnavigate the globe. He would become the 14th navigator in western history, and the first Frenchman, to sail around the world. This was the first expedition circumnavigating the globe with professional naturalists and geographers aboard. The use of Bougainvillea against sand flies. 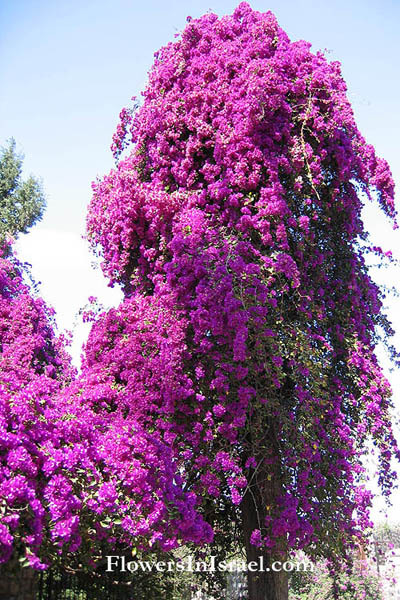 Recent publications indicate that Bougainvillea plants serve as an effective attractant to sandflies and kill the insect when it feeds on them. Schlein, Y., R. L. Jacobson and G. C. Müller (Department of Parasitology, The Kuvin Center for the Study of Infectious and Tropical Diseases, The Hebrew University- Hadassah Medical School, Jerusalem, Israel). "The sand fly Phlebotomus papatasi transmits Leishmania major in the Old World. In addition to blood the sand flies feed on plants. In a study of this diet we observed that one night feeding on branches of Solanum jasminoides, Ricinus communis or Bougainvillea glabra drastically shortened the life span of the sand flies. Flowering B. glabra attracted P. papatasi in the field. Nevertheless, in the endemic region of L. major, in yards abounding with vector sand flies, the number of P. papatasi trapped near hedges of B. glabra was eight times less (62: 502 flies trapped) than in the control sites. The results imply that B. glabra affords local protection against sand fly bites and decreases the risk of leishmaniasis".